A sailor’s life – 74. Monkbarns: Britain’s last Cape Horner? 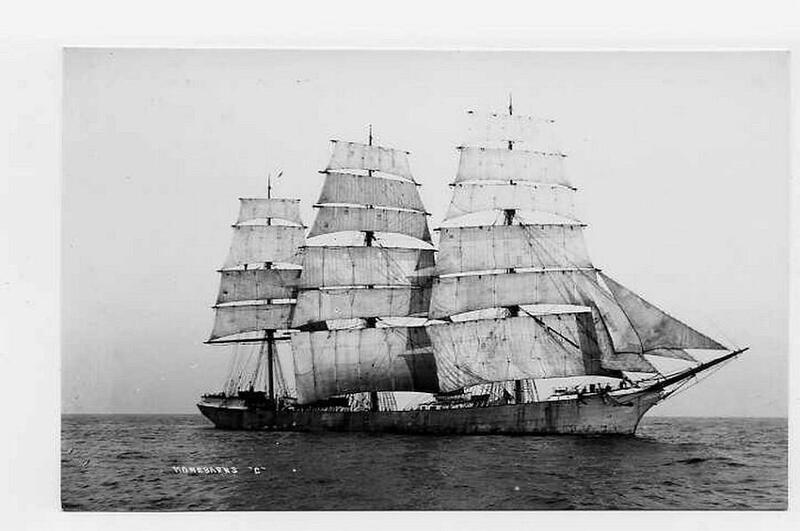 She was obsolete the day she slipped into the Clyde in June 1895: a steel-hulled, full-rigged, three-masted windjammer launched into an age of engines barely two years before Rudolf Diesel changed the world of shipping forever. The flax mill owner who had commissioned her, Charles Webster Corsar of Arbroath, named her Monkbarns after a local character from a Walter Scott novel (The Antiquary) and demanded everything of the best. The decking and rails were of teak, the accommodation for officers and crew particularly fine. “Her outfit includes all the modern appliances for the efficient working of such a vessel,” reported the Lennox Herald, the Saturday after she was floated. As a final touch, Corsar even gave her a little white Pegasus figurehead – which would make Monkbarns and her “Flying Horse line” sisters, Fairport and Musselcrag (1896), recognisable around the world. 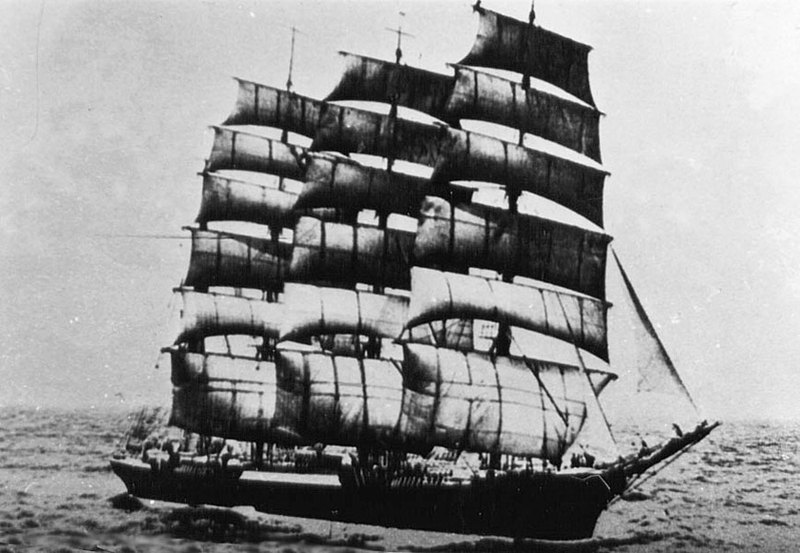 It was not whimsy but canny branding: Corsar’s flax mills and manufactory in Arbroath supplied the sailing ship canvas sold by the family’s cadet branch, D. Corsar of Liverpool – every bolt of it stamped with their trade name, Reliance, and a little flying horse. 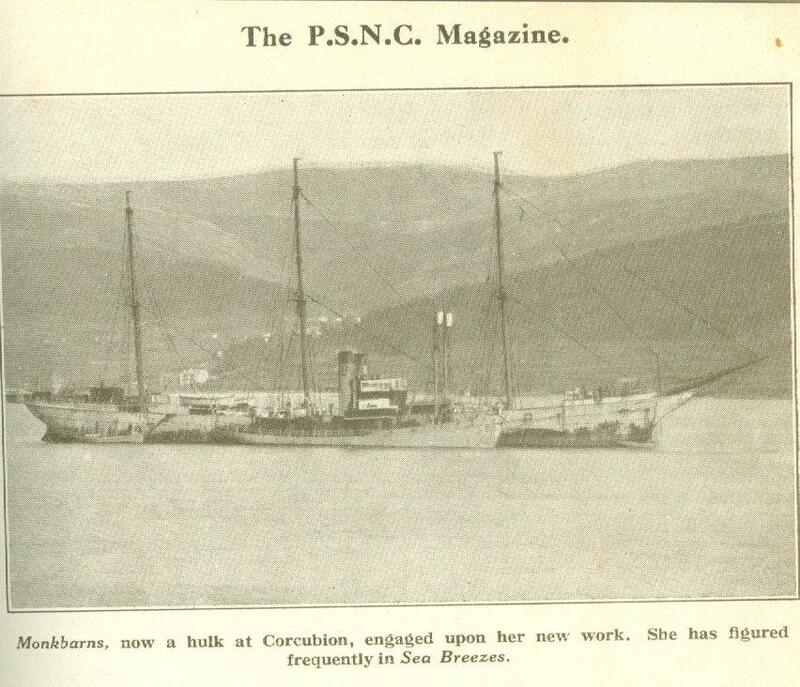 The Lennox Herald did not mention the figurehead, nor any further detail, merely remarking that the naming ceremony was carried out by Mrs David Corsar, Jnr, of Cairniehill, Arbroath. 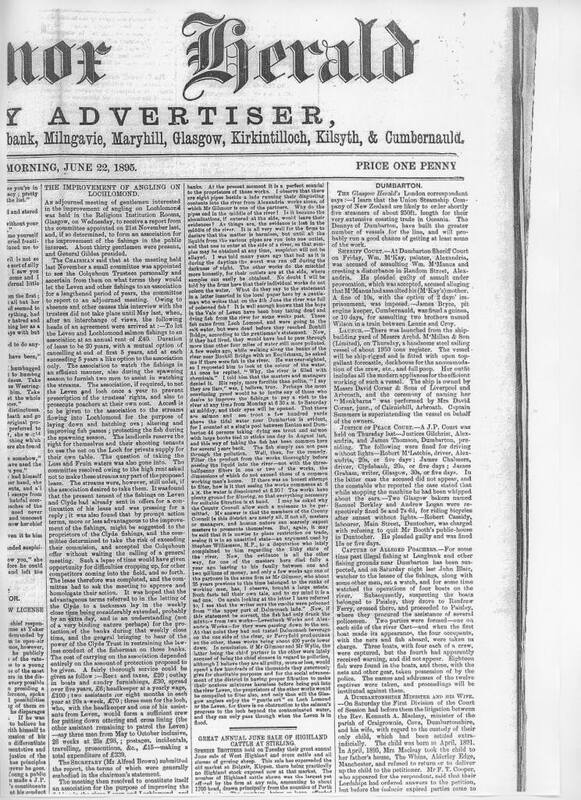 In fact, the launch by Messrs Archibald McMillan & Son (Limited) merited only a single paragraph in a round-up of Dumbarton news that week, wedged between reports about two men being fined 20 shillings each for driving without lights and a rumour in the Glasgow Herald that the Union Steamship Company of New Zealand was buying five new steamers, possibly from Dennys of Dumbarton, which had “built the greater number of vessels for the line, and will probably run a good chance of getting at least some of the work”. The reporter’s description of Monkbarns having “all modern appliances”, however, echoed down the years. 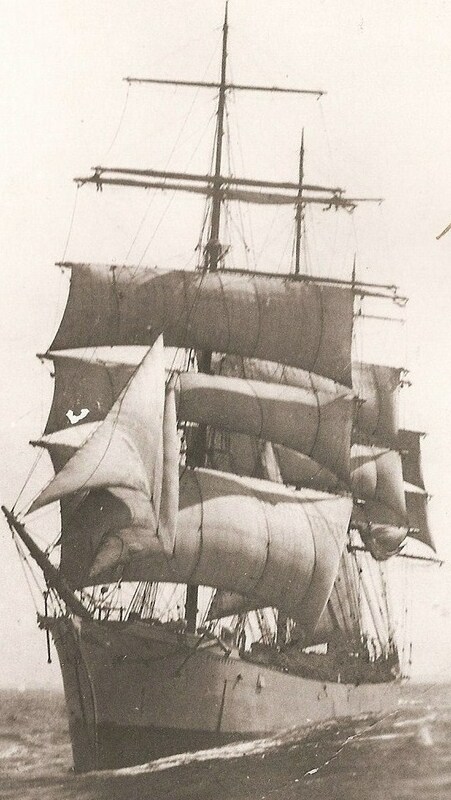 Frank C. Bowen wrote in 1930 that she had “every modern labour-saving device for working the cargo and sails” (Sailing Ships of the London River), and most subsequent authors took him at his word. Yet Monkbarns’ apprentice boys might have considered the matter rather differently. 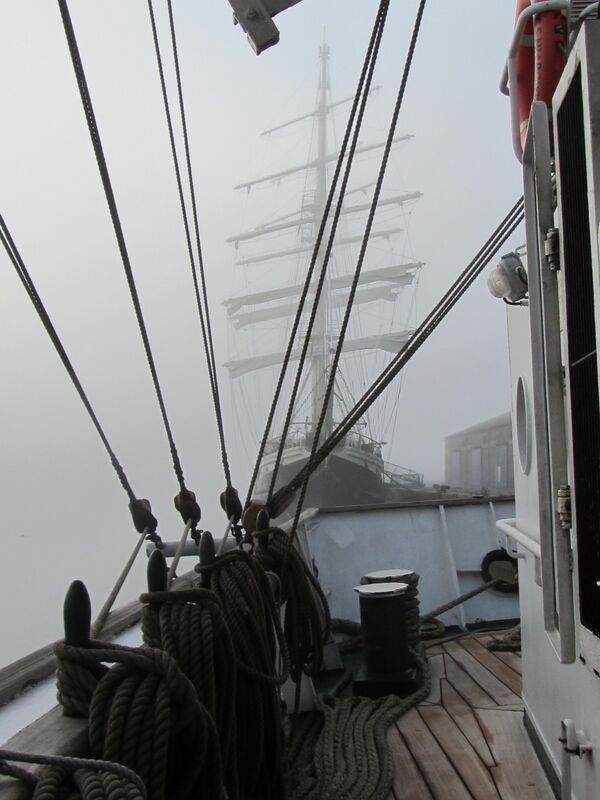 Like every other sailing ship of her age, she had neither light nor heat. The White Star liner Majestic, completed five years before Monkbarns, catered for 4,100 passengers with an à la carte restaurant and Pompeian swimming pool. But Monkbarns had kerosene lamps and the galley fire (weather and cook permitting). There was no electricity for refrigeration. Fresh vegetables and fruit barely lasted out of sight of land. Potatoes were stored in the dark and given a haircut every week or so. Meat was “preserved” in casks of brine. Margarine came in tins. Coffee was drunk black. Even the water was rationed. The boys were trainee officers – set apart from the sailors in the fo’c’sle and their masters in the saloon aft by virtue of being unpaid. 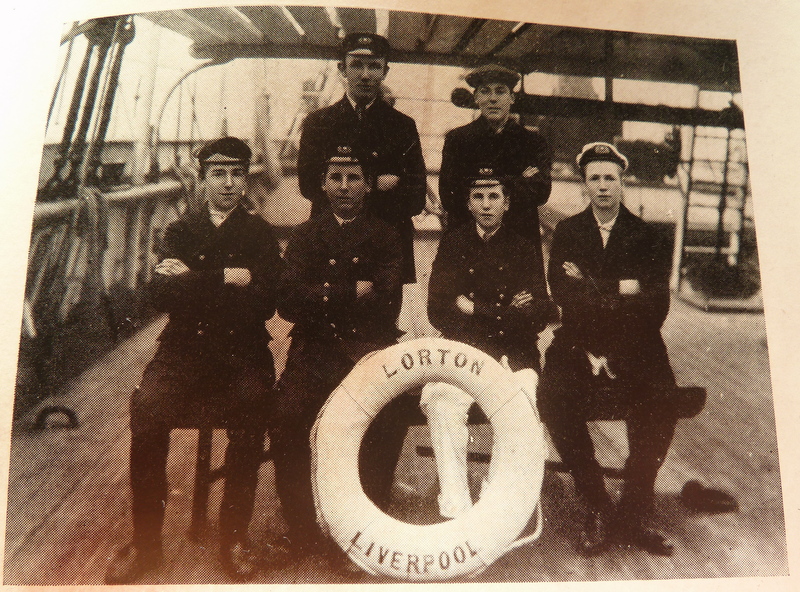 They lived in the “half-deck”, an iron bunkhouse amidships, which on Monkbarns latterly consisted of two rooms and a corridor with doors either end so that entry could always be from the lee side of the ship while at sea. It was an ice box in the winter and an oven in the tropics, but it had a skylight exit and a “monkey bridge” to the poop that was popular in heavy seas, when the decks were often awash to a depth of two feet or more. Monkbarns’ half-deck had bunks around the walls on three sides; a bare deal table with raised sides in the middle – flanked by boot-marked benches; a pot-bellied iron stove fed with coal filched from the cargo; and a battered cupboard in the corner divided into lockers, with fancy knotted rope tails for handles. There was a mirror, mottled with damp, and a single smelly kerosene lamp swinging in gimbals. The bunks were narrow, with high boards along the open side to stop the sleeper rolling out as the ship pitched, and coloured pictures – often of girls, sometimes a country scene – pasted to the surrounding bulkhead by previous occupants. By some hung a canvas “tidy”, containing needles and cotton for repairs. The apprentices had to do all their own own mending, darning and cobbling. Laundry had to be done in salt water, in precious time off and only when there was chance of the garment drying. New boys would arrive each trip with shop-smart dungarees and new straw mattresses, which the old hands in patched gear would regard balefully. Their own bunks were bare except for blankets, and within weeks the new boys learned why, when the “donkey’s breakfasts” had to be tossed overboard crawling with bed-bugs. Wet oilskins stayed wet, and chafing salt water boils were endemic. Aboard Monkbarns “all modern appliances” did not include a donkey engine until the mid-1920s, and in many ports her cargo was loaded and discharged by hand – the boys shovelling Australian coal out through the hatches basket by basket to waiting lighters off the coast of Chile, until the dust grated in their lungs and ground itself under their skin. As the last basket was hoisted out there would be shanties and a well-earned tot of whisky – unless the Master was a teetotaller. Then work would begin again, scouring out the filthy holds for the arrival of saltpetre, 200lbs a sack, which had to be swung aboard and stacked one by one in pyramids below. Monkbarns took about 3,000 tons, or 34,000 bags. The air would be like soup. 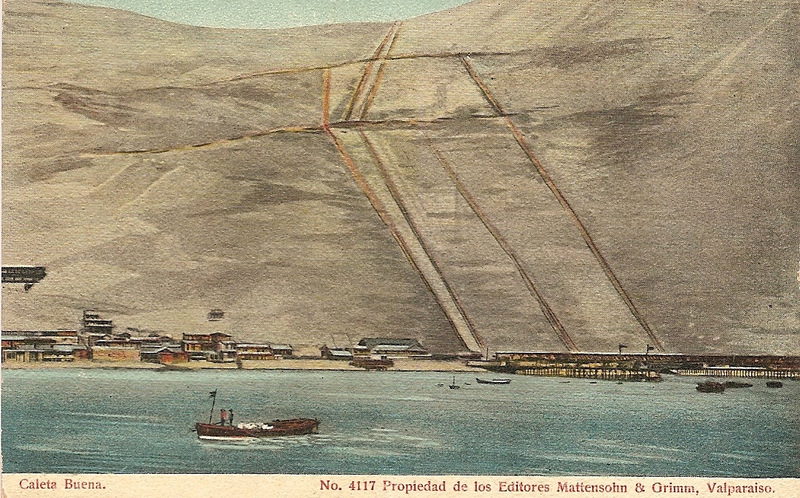 Out in the Chilean anchorages, in holds lifting and falling in the long Pacific swell, the evaporation from the bags was known to kill rats and even woodlice, and ship’s cats would lie down in dark corners and not wake up. outcrops further north, off Peru. But nowadays potassium nitrate is considered too dangerous to handle, let alone breathe. 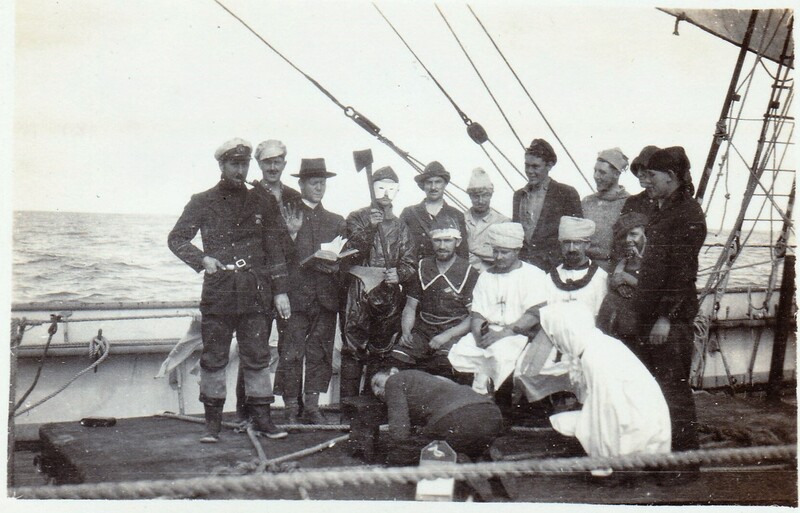 masted barques that set records and made fortunes for A.D. Bordes of Bordeaux and F. Laeisz of Hamburg shifted up to 5,500 tons of nitrates in eleven days flat, but they had steam winches – four to a hatch – and a small army of cadet officers and shore staff. Monkbarns did not. clinging to canvas in 1895. Many of the names familiar to us from the last days of sail were built after Monkbarns, including Penang and Pamir (both 1905), Peking and Passat (both 1911). 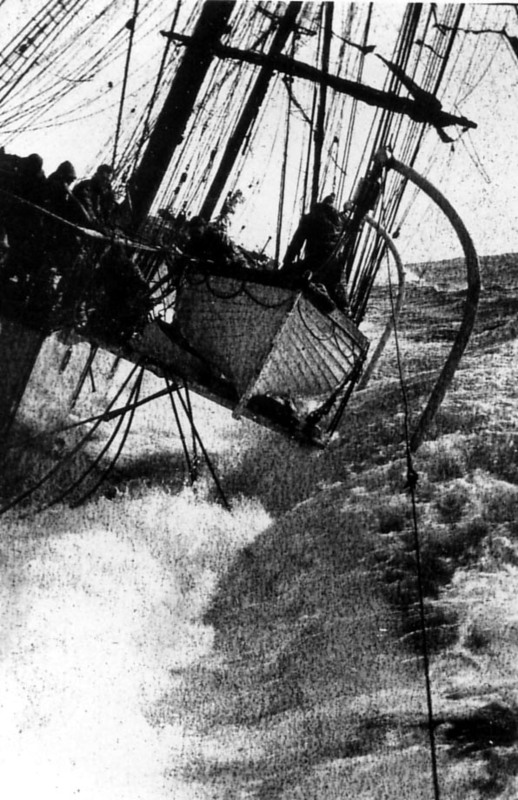 Though most sailing ships were less well equipped than the ships of the Flying P-line, they were still holding their own against steamers on the longer routes, to Chile and Australia, because of the price of coal – and the demand for sail-trained officers that would continue in motor-ships and oil tankers for many years to come. 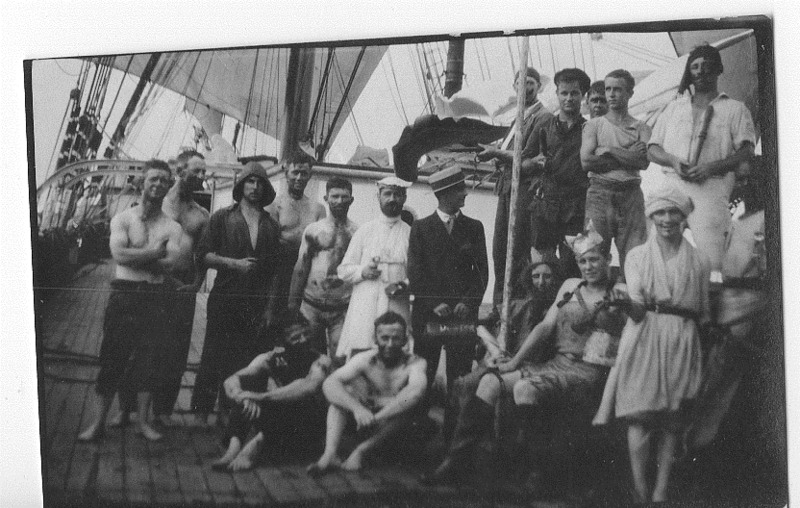 Boys were cheap, British ships indentured them for four years largely unpaid and by 1919 (following a mutiny aboard) Monkbarns had expanded her deck housing to accommodate a dozen of them. They often made up half the crew. Steamers couldn’t afford to hang around, but sailers could. And hang around they did, for months at a time by the end, waiting for a charter. 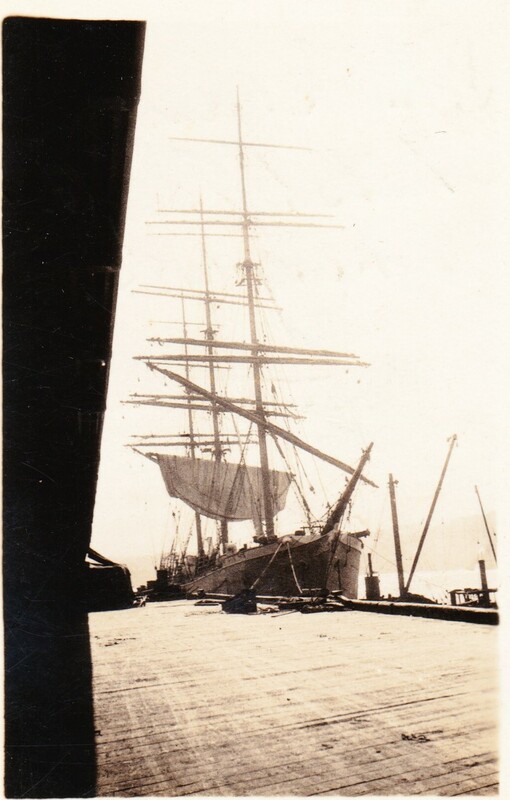 Monkbarns left Valparaiso with her last cargo under sail in early 1926: a load of guano salvaged from another victim of Cape Horn, Queen of Scots. 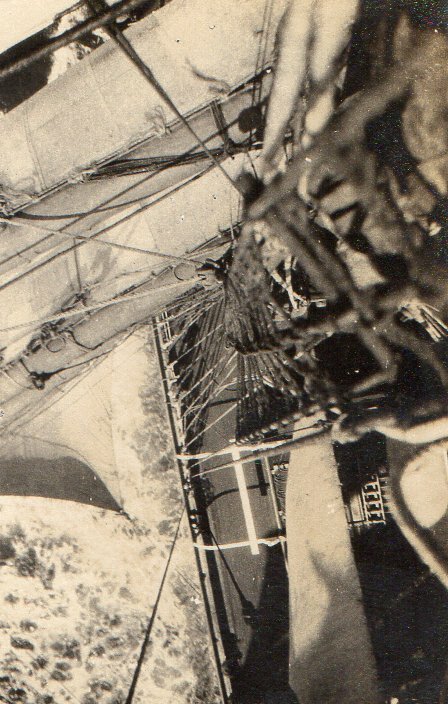 After they had sailed, the boys spent several days trimming the ship, wheeling the filthy stuff down the deck from the fore hold to the hatch aft. The ABs had refused, but the boys couldn’t. 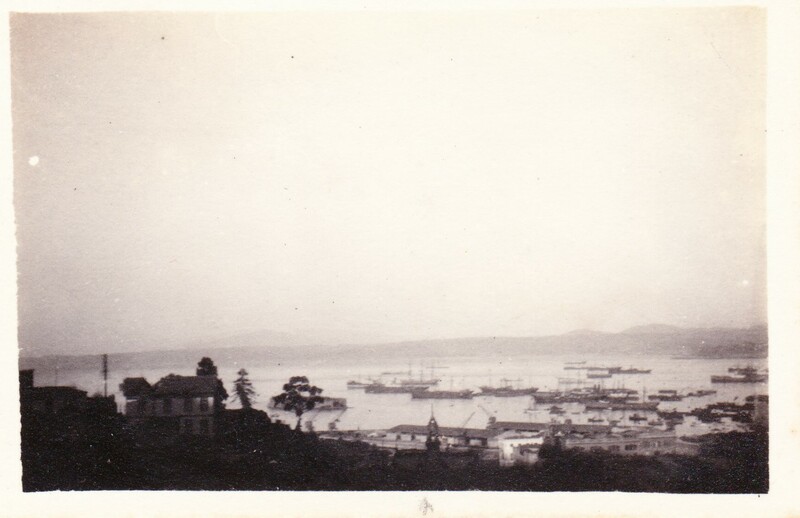 As is recorded elsewhere, it was to be a weary voyage; Captain William Davies died – probably of stomach cancer – and they put into Rio, they were becalmed, suffered baffling winds and ran out of food. They finally arrived in the Thames under tow after 170 days out and anchored off Gravesend, amazed at the sheer volume of traffic, big and small steamers passing in a continuous stream. Fresh meat and veg were delivered aboard and dinner that night was sausages and boiled potatoes. “I can say that never was a meal so appreciated,” wrote young Bainbridge. The following morning they began heaving up the anchor at about 8.30am, to the shanty Rolling Home followed by Leave Her, Johnny, Leave Her, for the final leg to Charlton Buoys. 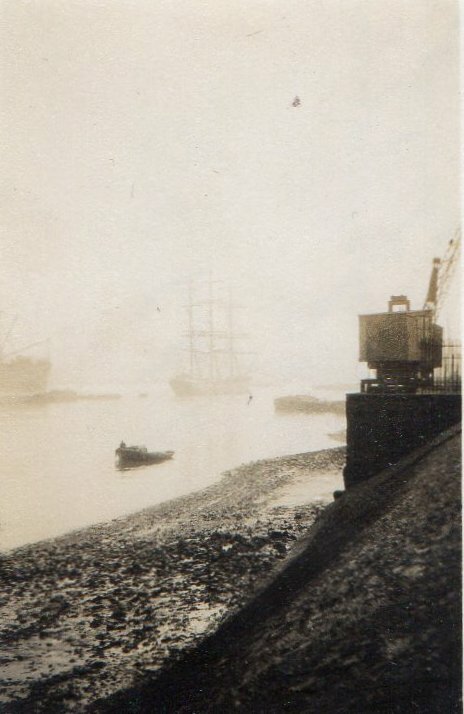 It was July 1926, and Monkbarns was the first full-rigged ship to come into the Port of London for eight years, “a wandering and lonely ghost which we may not see again,” wrote The Star. The Times called her “a picture out of the romantic past”. Chips the ship’s carpenter was more prosaic. “I’ve had six meals since I came ashore 16 hours ago,” he told the Westminster Gazette, “and I’m still hungry.” Monkbarns was to find only one more cargo – Welsh coal, which she delivered under tow, to her new Norwegian owners off Corcubion in northern Spain the following March. She finished her life as a coal hulk to the whaling industry – the last British full-rigged ship to sail round Cape Horn, according to Alan Villiers (Sea-dogs of To-day, 1932), still bunkering passing steamers as late as 1954. My last sighting is from a personal letter. 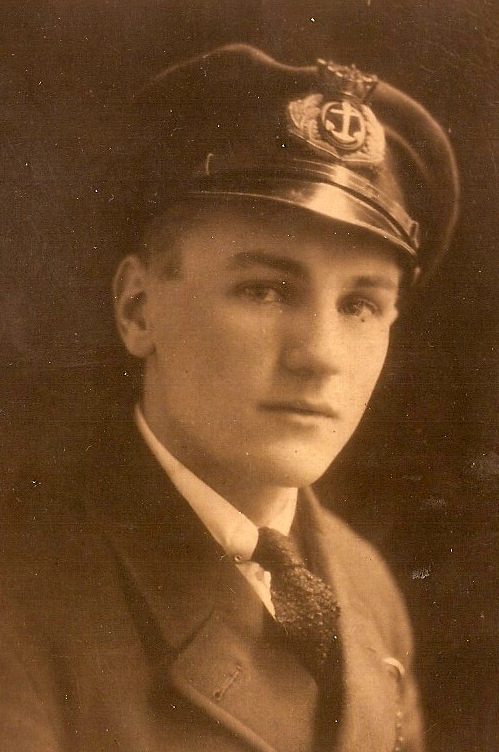 Brian Watson, later senior pilot/deputy harbour master at Montrose, was then a nosy British steamship apprentice in the Baron Elibank. In 1954 he spotted a name in raised letters on the nearby bunkering hulk after his ship had sought refuge in Corcubion bay during bad weather. He recognised she was an old Britisher and climbed aboard for a look round. 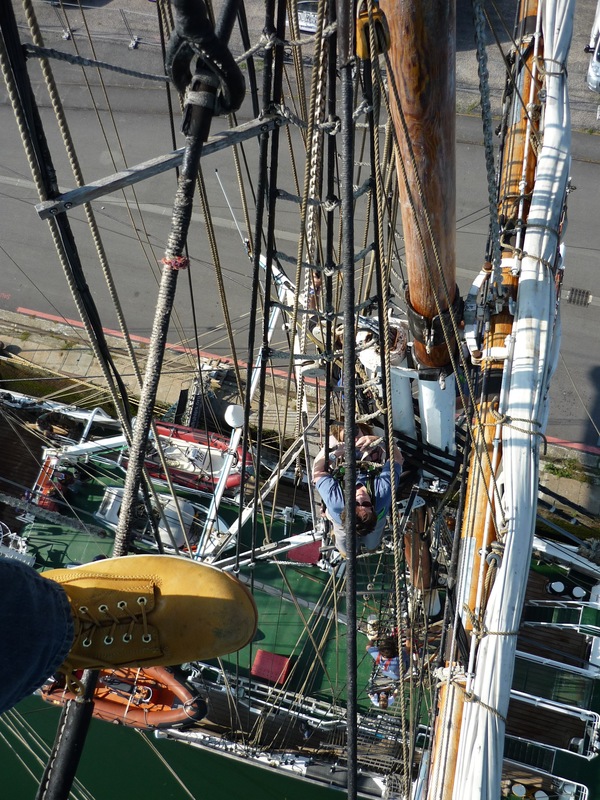 In 1999 he wrote: “We berthed alongside a coal hulk and I could clearly see her name Monkbarns the metal letters still visible on her counter stern.” He said the masts had been cut down to stumps and he thought the bowsprit had been cut away, most of the deck and poop cabins had been stripped, a rusting galley stove had been moved into the poop accommodation. Unfortunately, he was spotted by the steamer’s Mate and chased back to work before he could check the bows for the little white horse. Sadly, I can find no further trace of what became of Monkbarns. Is there anyone among our readers who can put Jay in touch with a reliable Spanish or even Basque maritime museum or historian? 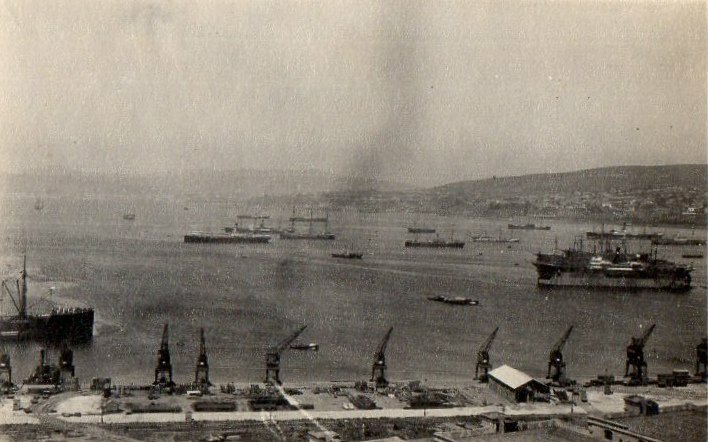 It is likely the old ship was broken up at Ferrol, Biscay. 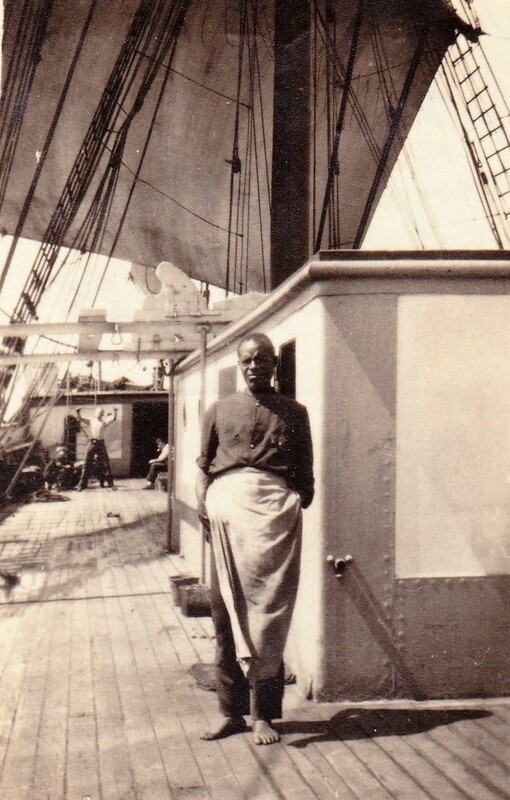 He remembered the “lovely women” who had brazenly boarded his ship during the month he as a “first tripper” had spent in Trinidad in 1919 waiting for cargo. The crew had dropped lines over the side to haul the girls up, and sold the shirts off their backs when their money ran out. By the time the ship got to Port Arthur, Texas, where the Americans inspected every man jack of them, there were less than a dozen men aboard who had not got VD, he recalled. 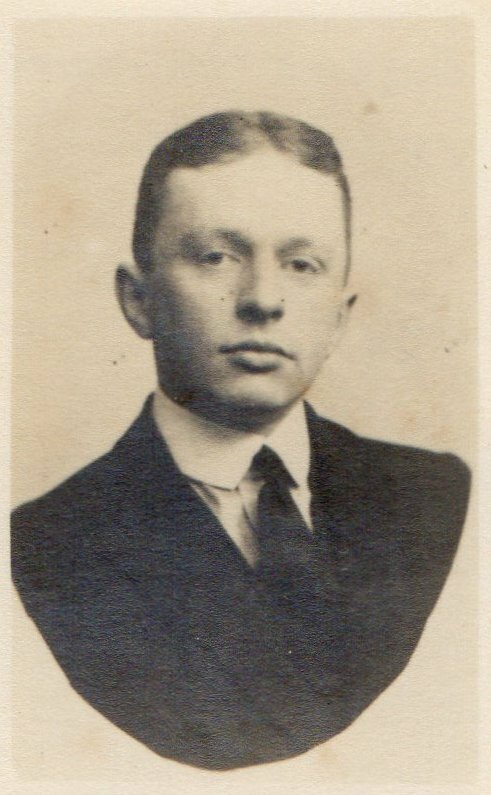 Bill’s mother was a doughty woman who had signed her younger son’s indentures and paid the bond as soon as shipping firms began to recruit apprentices again after the war. 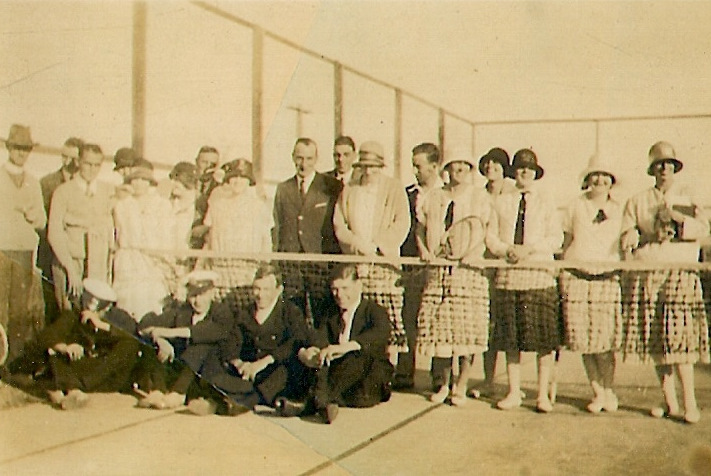 Bill’s brother Alf had been an apprentice on John Stewart’s barque Lorton with Algie Course and was one of the crowd of boys in Newcastle NSW with Bert Sivell in September 1913, revelling in the tennis, tea dances and charabanc trips organised by the mission while their ships lay along the Dyke. Bill recalled the excitement he had felt as a ten-year-old being rowed out to his brother’s ship at Tilbury when a wave splashed over him, and the burly seamen nodded sagely and said “that means you’ll go to sea too, lad”. 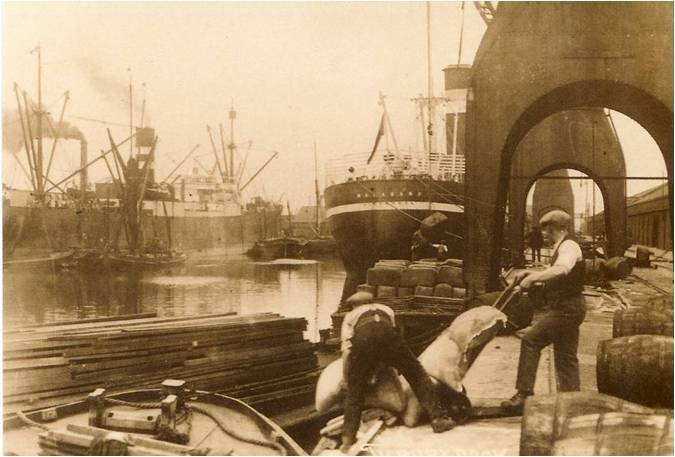 When Lorton was “sold foreign” in 1914, Alf transferred to the barque Edinburgh. 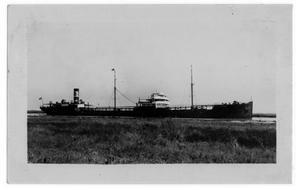 But in 1916 she was captured by the raider Möwe. The Germans had hauled out the crew and two live pigs and sent the old barque to the bottom of the sea with all sails set. The tropical night had been so clear, Alf Jefferies used to claim, that they could see her canvas shimmering whitely under the water after she’d vanished. Even the enemy commander was supposed to have sighed “Beautiful even in death”. Among the prisoners below decks, the squeals of the pigs being hoisted aboard the raider were reported to have given rise to the rumour that the Edinburgh’s captain had his wife with him, and that she was hysterical. By the time Bill Jefferies went to sea, it was a much lonelier life than Alf had sketched. The old square-riggers’ crowd of apprentices had dwindled to just three on Bill’s oil tanker, and even before these greenhorns reached their ship a plausible bloke posing as the shipping agent managed to relieve them of their luggage so they had to be kitted out from the slop chest. Once underway they got seasick and the mate, an old sailing ship man, sent them down the hold to scrape paint pots while the tanker heaved and plunged in a south-westerly gale. After they’d been sick, to windward — another mistake they did not make twice, he ordered them to shift stores. For two days they were kept constantly on the move. But it worked. Bill never suffered sea sickness again. “They really were a motley crowd, seamen of all nations except our enemies,” said Bill aged 90, remembering that first ship in 1919. “We had a British bosun, a Belgian carpenter – a tall man with fierce whiskers who used to cause a lot of trouble when he was drunk. We had Latvians and Estonians, two Chinese cooks, and a Dutch chief steward. 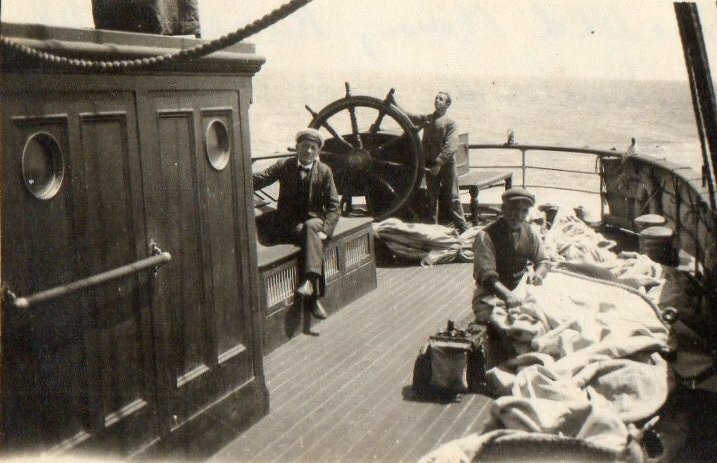 The average seaman in those days was either very old or a foreigner.” The fierce Welsh captain who kept his apprentices out of trouble had been torpedoed five times, or so he claimed. But by 1920, US production of gasoline (petrol) alone was 116 million barrels (42 US gallons per barrel) – from less than 7 million barrels in 1901. Across the world the oil industry was booming. Coming next: Clan line or Shell? 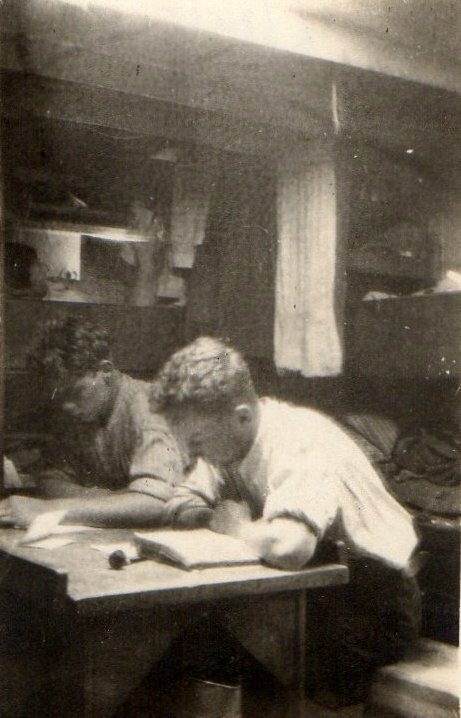 There was a new crop of apprentice boys in the tin bunkhouse amidships by the time Monkbarns arrived back in Newcastle NSW, Australia, in November 1920, after the end of first world war; new faces in the patchy mirror on the bulkhead and new views of “home” pasted to the walls of each narrow bunk. 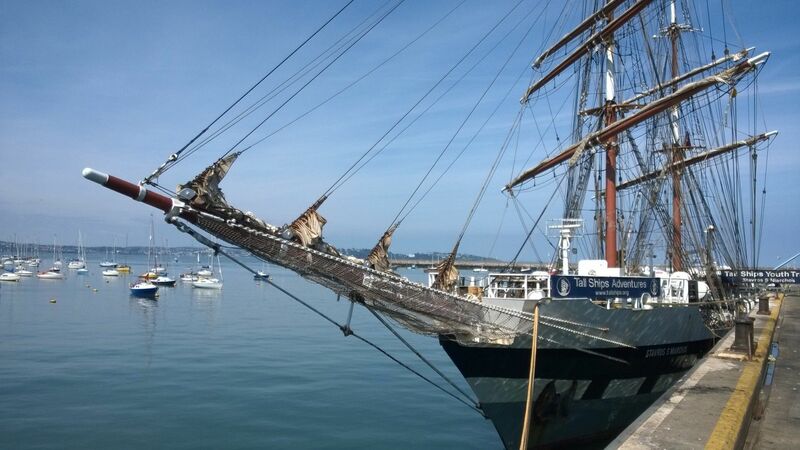 Many of the old sailing ships had been lost, but not “lucky” Monkbarns. There were four other British square riggers in port too, they remembered, with 37 apprentices between them, plus boys from the French Champagne and Danish Viking. 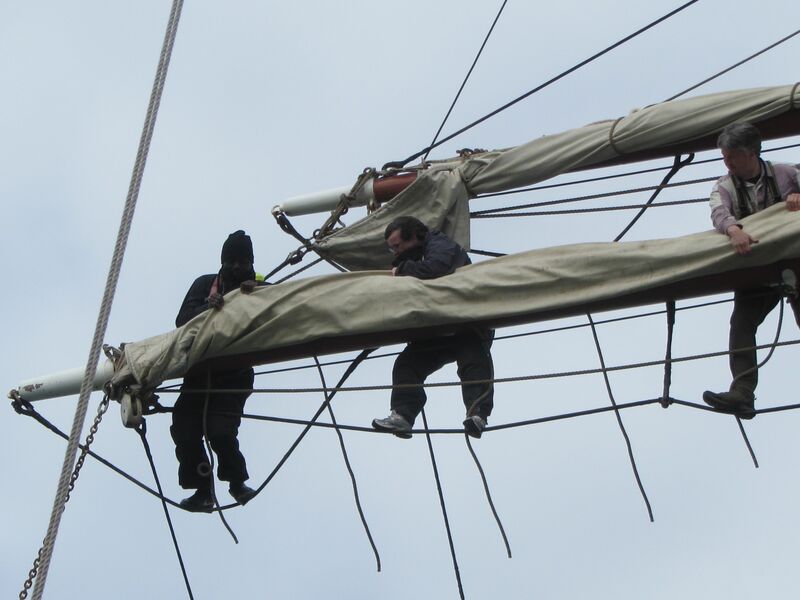 The Monkbarns apprentices were given the afternoon off to hear a concert at the Seamen’s Mission in Stockton and for most of the next month had time off to lounge about the beach, play tennis and go on picnics with the pretty girls, while they waited for repairs to one of the masts. 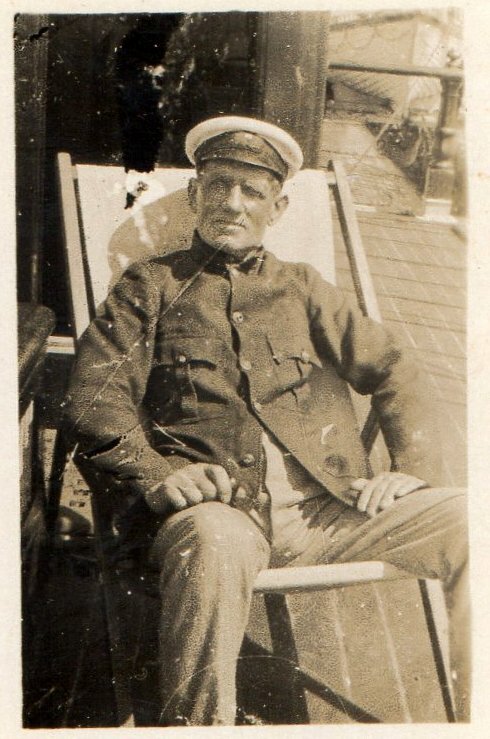 Captain Harry Fountain, one of many dozens of boys who passed through Monkbarns’ half deck over the years, served the sea all his life and lived to the ripe old age of 95. 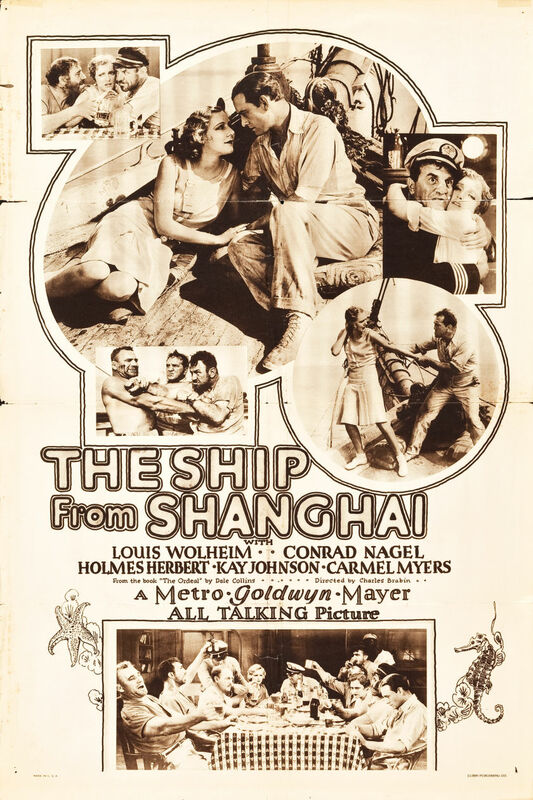 What became of “Tich” Copner, Reg Bannister (“who snored like hell”) and the Belgian, Marcel Emil Brough, I never discovered, but Fountain never lost touch with his old shipmate Lionel Walker, who had settled on the other side of the world with the Aussie mission girl he had gone back to find. 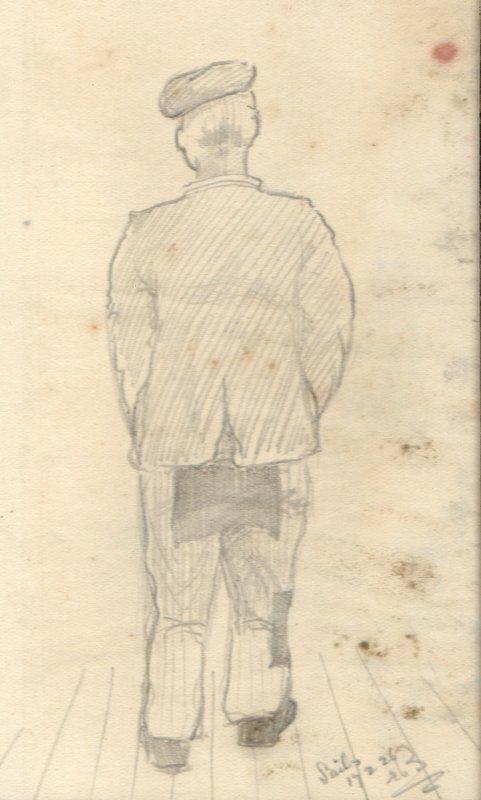 Jessie Walker’s family gave me his last known address when I traced them – a damn fool Pom grandchild still doggedly hunting witness accounts of life on Monkbarns three-quarters of a century later – and with typical generosity they heaped on me newspaper cuttings and photographs of the charabanc trips and tennis parties. But my letter to Harry in Boston, Lincolnshire, was returned by his executors: Captain Fountain, retired harbour pilot and sometime pub landlord, was finally at rest under the handsome headstone he had bought and gleefully visited for many years on his daily walk to the docks. He told his local paper the secret of his longevity had been cold showers, bread and dripping, and 20 Senior Service cigarettes a day. The solicitor put me in touch with one of the old man’s friends. “He would have loved to have talked to you,” they both said. I had missed him by four months. Imagine if you will a world without cheese, or milk, or apples, or even a carrot or cabbage leaf. Imagine day after day, tin pannikins with the same boiled salt meat and dried pulses, uniform brown, with never a hint of tomato, unrelieved by soft bread or clean water. The sailing ship indenture Bert Sivell signed in August 1911 specified that John Stewart & Co were to provide “sufficient” meat, drink and lodging. But “sufficient” is a subjective term. The provision of food in British merchant ships was regulated by the Board of Trade and a scale was printed in the ship’s articles where all aboard might read it, forestalling argument. But there was a saying in sailing ships that while God provides the food, the Devil provides the cook. 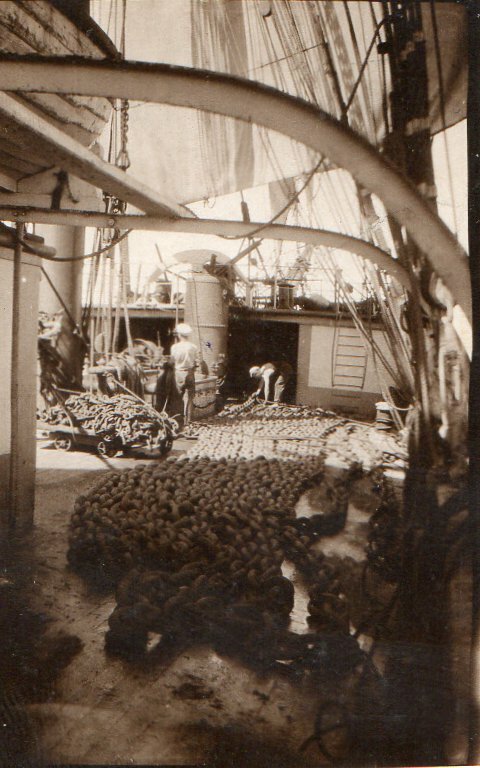 Vegetables and fruit lasted about a fortnight after leaving port, fresh milk and butter rather less. 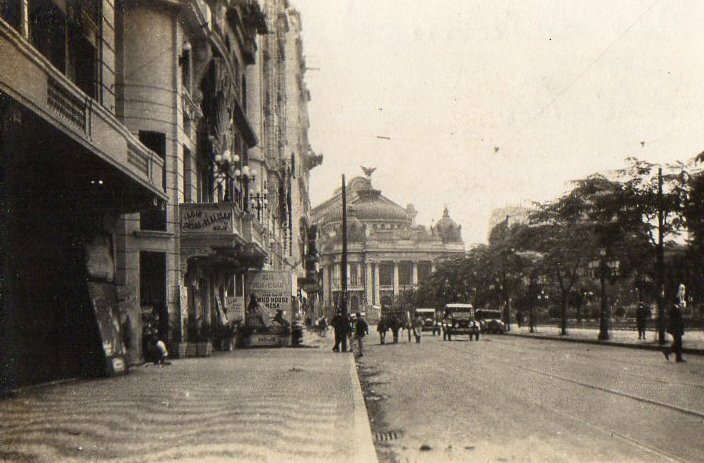 Thereafter – possibly for months on end until the next landfall – there were sacks of rice and flour and split peas, and casks of meat, and evaporated milk and butter in tins. The Board of Trade stipulated masters should provide each man with a quart of water and a pound of salted pork or beef a day, which was usually served on alternate days with pea soup or rice or (weather permitting) bread, and whatever was left over appeared again for dinner. All quantities were strictly laid down: a pound of bread daily, 1/4 lb rice twice a week, 2 oz of preserved potatoes three times a week, and 2/3 pint of peas. The agreement even detailed acceptable substitutes — a pound of ship’s biscuit in the absence of flour, 1/4 oz of tea instead of 1/2 oz coffee beans. Tea, coffee beans, sugar, marmalade, butter and condiments were distributed as weekly stores for individual use and safekeeping, and again in the quantities strictly laid down by the Board of Trade. Although bigger ships might carry chickens and a couple of pigs, they too were prey to the weather, and after ten days on salt meat British masters were legally obliged to serve lime juice, to prevent scurvy, which made your gums swell and your teeth fall out. “Limeys,” jeered American crews. By his mid-twenties Bert needed false plates top and bottom. 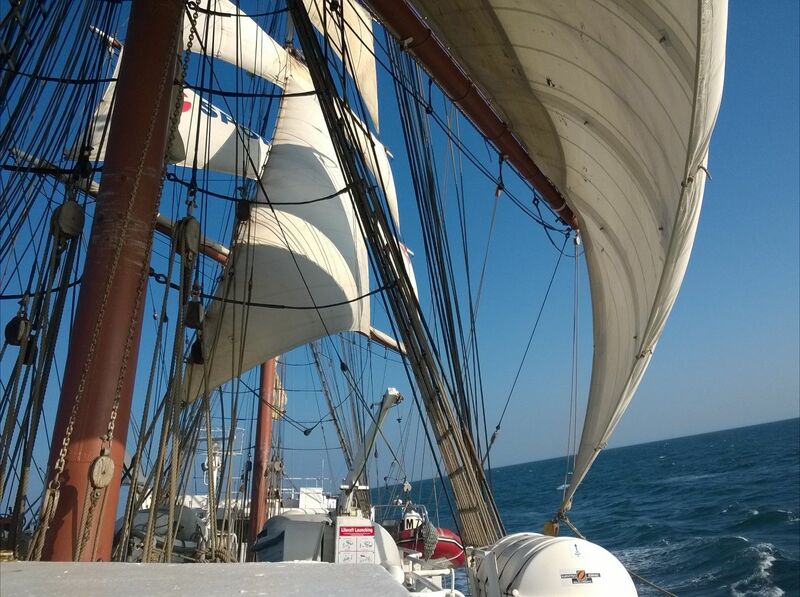 Meat on Monkbarns was kept, unrefrigerated of course, in casks of brine below decks and tipped into a locked, iron-bound teak harness cask on deck abaft the mizzen mast as needed. There, it warped in the wet and heated in the sun until the surface ran with all the colours of the rainbow and “care was needed in passing to leeward if you were fastidious”. It was served, boiled with dried potatoes and beans, as wet hash (stew) or dry hash (cottage pie), or sometimes as curry with rice or “Boston baked beans” (in molasses). On Sundays, as a treat, there was tinned meat and “duff” – plain suet with molasses. And on cold days there was “burgoo” or oatmeal porridge, galley fires permitting. But everything was prone to decay. 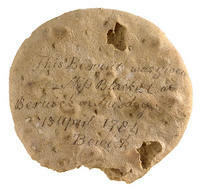 Drinking water went brackish in the sun and weevils soon wriggled in the flour, the oatmeal, and even in the hard tack or ship’s biscuits, which were three-inch squares triple-baked to a rock-like dessication that was supposed to ensure they “kept” for five years. The trick was to tap them on the table so the beetles fell out and then soak them in coffee, Bert told his son. 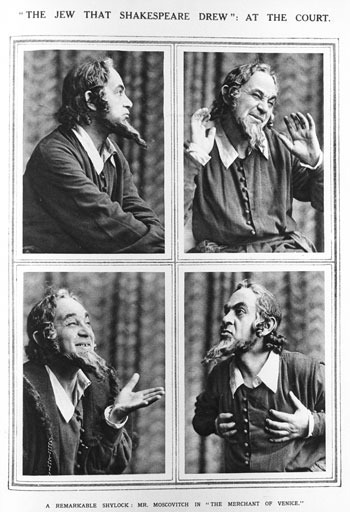 He had little sympathy with children who would not eat their sprouts. As the weeks stretched into months at sea, the packages of little comforts packed by the mothers far away slowly emptied and the new dungarees began to sprout rents and patches. Saltwater boils erupted on necks and wrists from the chafing oilskins, and the daily scrubbing wore calluses into hands and knees.